A Powerful and Free VST Host with Beautifully Designed & Touch Friendly UI! If you're looking for a simple way to play VST plugins in realtime, we think you're going to love our free VST host Cantabile Lite. 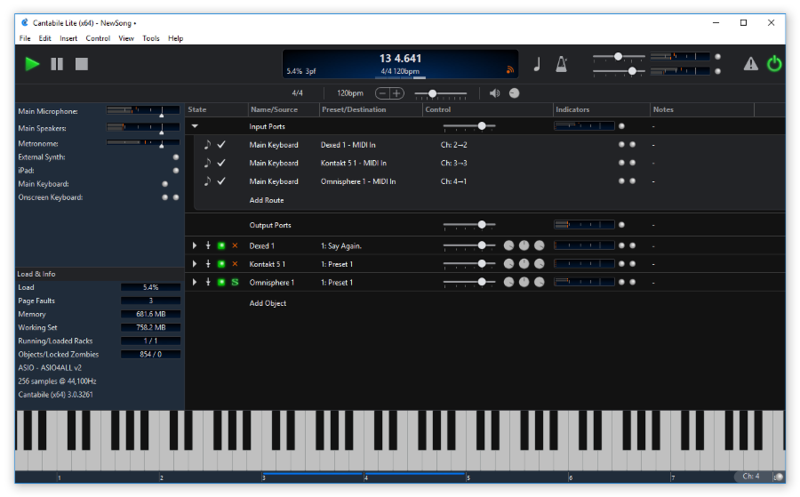 Cantabile Lite includes the high-performance audio engine and beautiful UI from it's big brothers Cantabile Solo and Performer. It's perfect if you just want to play a couple of instruments, add some effects, or design and audition new sound presets. It installs in seconds, is really easy to configure and super stable. And yes it really is completely free! Includes both x86 and x64 editions. Works on Windows 7, Windows 8 and Windows 10. For Windows XP and Windows Vista use the older 32xx series builds available here. Mix and match x64 and x86 plugins with built-in jBridge support. If down the track you find you've outgrown Cantabile Lite your saved files can be loaded into Cantabile Solo and Cantabile Performer. No need to setup everything again - just upgrade and start using the new features.